(Nanowerk News) Integrated circuits, which are in everything from coffeemakers to computers and are patterned from perfectly crystalline silicon, are quite thin -- but Cornell researchers think they can push thin-film boundaries to the single-atom level. 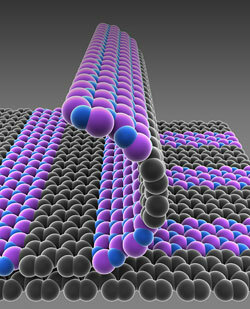 Schematic illustration of single-atom-thick films with patterned regions of conducting graphene (gray) and insulating boron nitride (purple-blue). The technique, which they call patterned regrowth, could lead to substrate-free, atomically thin circuits -- so thin, they could float on water or through air, but with tensile strength and top-notch electrical performance. "We know how to grow graphene in single atom-thick films, and we know how to grow boron nitride," Park said. "But can we bring them together side and side? And when you bring them together, what happens at their junctions?" As it turns out, researchers' patterned regrowth, which harnesses the same basic photolithography technology used in silicon wafer processing, allows graphene and boron nitride to grow in perfectly flat, structurally smooth films -- no creases or bumps, like a well-knitted scarf -- which, if combined with the final, yet to be realized step of introducing a semiconductor material, could lead to the first atomically thin integrated circuit. Patterned regrowth is a bit like stenciling, Park said. He and colleagues first grew graphene on copper and used photolithography to expose graphene on selected areas, depending on the desired pattern. They filled that exposed copper surface with boron nitride, the insulator, which grows on copper and "fills the gaps in very nicely." "In the end, it forms a very nice cloth you just peel off," Park said. The team was helped by already being skilled at making graphene -- still relatively new in the materials world -- as well as Muller's expertise in electron microscopy characterization at the nanoscale. Muller helped the team confirm that the lateral junctions of the two materials were, indeed, smooth and well connected. The paper's co-first authors were chemistry graduate student Mark Levendorf and postdoctoral associate Cheol-Joo Kim, who fabricated the graphene and boron nitride samples and also performed the patterned regrowth at the Cornell NanoScale Science and Technology Facility.